Commodity Futures Can Be Intimidating. We Can Help. Few grain and livestock producers want to "go it alone" in the futures and options markets. Farming and ranching aren't nine-to-five occupations, and many producers simply don't have the time or inclination to try deciphering the ins and outs of the futures and options markets on their own. 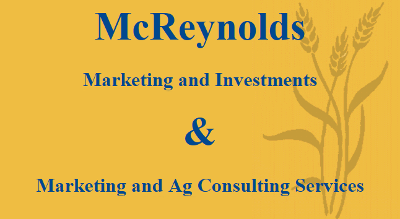 McReynolds Marketing & Investments has provided clients with futures and options hedging and trading guidance since 1986. Additionally, we offer fee-based grain market consulting services, and help farmers find the hedging strategies they are most comfortable with. Jeff McReynolds grew up on a diversified grain and livestock operation in Osborne, Kansas. He is a 1985 graduate of Kansas State University with a degree in Agriculture Economics, and has been in the futures and options industry ever since. He is now the owner of McReynolds Marketing & Investments, which is a full-service commodity brokerage specializing in agriculture futures and options. We are located in Hays, Kansas. Disclaimer: The risk of loss in trading commodities can be substantial. You should therefore carefully consider whether such trading is suitable for you in light of your financial situation. The high degree of leverage that is often obtainable in commodity trading can work against you as well as for you. The use of leverage can lead to large losses as well as large gains.